As I blogged about back in April, Maureen and Chris were married a few months ago. 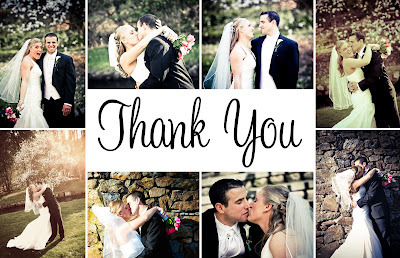 Well, I recently designed their wedding thank you cards using their professional wedding pictures. Cute, right? Reenie handed me her CD of pictures literally the moment she got them so that we could order the thank you cards. Last night I was looking through some of the pictures on the CD when I came across a few that I literally stopped me in my tracks. And then I couldn't stop laughing. 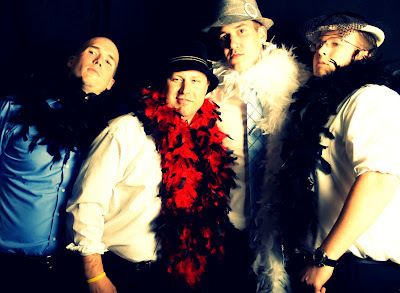 Ya see, Reen and Chris had a photo booth and props at their wedding. 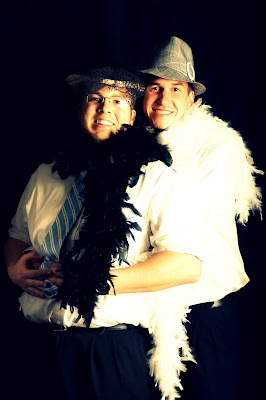 Throughout the reception, anyone could go and have their picture taken. These were the two best shots of the night. I think I might have them framed. I <3 you for posting this! i want to hang that last picture on my wall...no joke, i love it with all my heart. I'll order it on Shutterfly for you, Kac. Is 11x14 too big? can i have a poster size of the one of bobby and ryan?